Everyone likes to come home to a sparkling clean house. If you hire a Bangkok maid service such as DO4YOU to clean your house, you may want to give your cleaning service provider some instructions as what you want them to concentrate on. And once you’ve these given instructions, your cleaner will try and focus on those areas. However as the seasons change, you may notice that some areas of your home become prone to becoming dirtier or simply need more attention because of the changing weather patterns. You need to change the focus of the cleaning instructions to account for the changes in seasons. After the rainy season has ended, there is usually a dry period of cooler weather when the dry winds can blow steadily through the open windows of your home. These winds can carry dust, soot and small particles that can build up on your balcony and floors. If you have heavy drapes, you may want to ask your provider to have them cleaned to get all the dust and soot out of them and prevent them from becoming discoloured. This is a special service that can be arranged by DO4YOU. They can also clean your upholstered furniture and rugs. The hottest weather in Thailand occurs in March, April and May at the end of the long dry season. Ants can invade your home looking for a source of water. 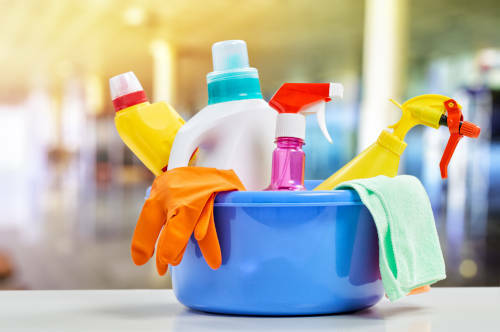 If you are using insecticides to control these infestations, you’ll want to have your cleaning service scrub any countertops and flat surfaces regularly to get rid of any insecticide residue which can drift a ways from where you have sprayed it. This is particularly important if you have any children or pets in the house. These smaller family members can be affected more than adults by the insecticide. During the monsoon season, humidity becomes an issue in your home. And with the onset of an increase in the humidity, mildew can become a problem. You should leave plenty of space between the clothes you have hung in your closet to allow air to circulate around them. And clothes that you have stored should be checked every now and then to be sure you don’t smell any mildew developing on them. You may be able to avoid all this by having dehumidifiers in your carpeted rooms. Dehumidifiers can save your clothes as well. In fact, dehumidifiers may be the answer during all those long and rainy months when you have to keep your windows closed against the weather. They can keep your home from developing the smell of mildew and dampness that can happen when your home is closed up and the air can’t circulate properly. At DO4YOU, we provide an on-demand maid service, dry cleaning service and laundry service through our convenient to use smartphone app. Our staff members understand the toll the different seasons can take on your home and we can adjust our cleaning services to account for them. We know what to watch out for and what to spend special time cleaning during each of the four seasons and the cleaning problems they can cause for your home. We watch for ant infestations and take particular care to keep surfaces and countertops clean and sanitised against any lingering insect repellents during the hot summer months when bugs and ants tend to invade your home looking for water. And we are particularly vigilant during the rainy months of the monsoon when mildew can become such a problem, making sure we don’t leave wet surfaces and floors that can add to the overall dampness of your home. DO4YOU also offers a laundry and dry cleaning service that can rid your closet-bound clothes of any mildew spots and smells that can develop during the long monsoon season. Be prepared for cleaning problems of seasonal change by taking advantage of our professional maid service. We’ll keep your home in sparkling clean condition no matter what time of year it is. Contact us via our DO4YOU app which can be downloaded from the Google Play store and the Apple App store.